..her rippling hands looked gracious, and her spinnings were reminders that such motions were known long beforethey became popular among modem-dance choreographers. Similarly, solos in which the dancers let pieces of fab-ric swirl about them, suggested why ... the innovative choreographers and stage designers for Diaghilev's Ballets Russes werefascinated by the curving lines of Middle Eastern dances. 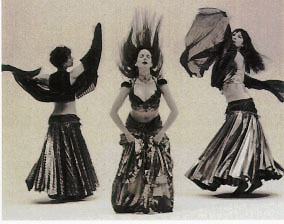 The Company specializes in dances of the Near and Middle East - Turkey, Morocco, Egypt, Armenia, Persia - and has been acclaimed for its ability to perform in a wide range of styles, from traditional to contemporary interpretations, incorporating elements from ballet, modem dance and jazz. The repertory is unique and original and the dancers and musicians the best in their field. Inspired by the Berber dances of southern Morocco, this dance incorporates elements of trance dances found throughout the Middle East, and conveys the mystical power and vitality of tribal communion. Accompanied by percussion ensemble in North African style and meter. The dances of Armenian women often depict elements in nature and are notable for their haunting sweetness and poetic imagery This lyrical dance, derived from a traditional maiden's dance, in characterized by a skimming, graceful quality and an expressive and subtle use of the hands and upper body. A dance at twilight performed to a poignant rendition of an old Greek song, arranged by the renowned Greek composer, Vangelis, and sung by Irini Pappas. A unique exploration of middle eastern dance rhythms and styles. Choreographed by the dancers; they accompany themselves on zills (finger cymbals) aided by a percussion ensemble (meters: Arabic Masmoudi 8/4, Beledi 4/4, Zaar 2/4, Oriental Chifte Telli 8/4, Moroccan 6/8, Turkish Karsilama 9/8).